What is senna? What is it used for? 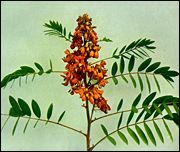 Senna is a shrub found throughout India, Pakistan and China. Its name is derived from the Arabic word "sena," and it has been used in ayurvedic and unani medicines since the ninth century. The shrub grows to a height of approximately two feet, with green stems and pods and yellow, scoop-shaped leaves. The leaves and pods, or fruit, are used medicinally. The active substances in senna leaves and fruit are called sennosides. These molecules are converted by bacteria in the colon into another substance, rhein-anthrone, which has two beneficial effects. First, it stimulates colon activity, which speeds bowel movements and improves digestion. Second, it increases fluid secretion. Traditionally, senna was used as a laxative and was considered a "cleansing" herb because of its cathartic properties. More modern studies have found that senna is useful in treating constipation, whether it is caused by pharmaceuticals or natural means. It may also be used to treat skin conditions such as ringworm and acne. How much senna should I take? Some practitioners recommend taking an herbal extract that contains 20-60mg of sennosides per day. What forms of senna are available? Senna is available in tablet, capsule and extract form. Senna leaves can also be made into a paste and applied to the skin. What can happen if I take too much senna? Are there any interactions I should be aware of? What precautions should I take? Continued use of senna can cause the colon to become dependent on it to function properly. Therefore, practitioners recommend that it should not be used for more than 10 days consecutively. Chronic senna use can also cause loss of fluids, low potassium levels and diarrhea, which can lead to dehydration and muscle damage. Patients with Crohns disease, intestinal obstructions and abdominal pain should not take senna supplements. In addition, it may react adversely with digoxin, a heart medication. Ewe K, Ueberschaer B, Press AG. Influence of senna, fibre, and fibre+senna on colonic transit in loperamide-induced constipation. Pharmacol 1993;47 (suppl 1):242-8. Gruenwald J, Brendler T, Jaenicke C. PDR for Herbal Medicines. Montvale, NJ: Medical Economics, 1998, pp. 722-4. Kinnunen O, Winblad I, Koistinen P, Salokannel J. Safety and efficacy of a bulk laxative containing senna versus lactulose in the treatment of chronic constipation in geriatric patients. Pharmacology 1993;47 (suppl 1):253-255. Newell CA, et al. Herbal Medicines: A Guide for Health Care Professionals. London: The Pharmaceutical Press, 1996. Sennae folium and sennae fructus. World Health Organization Monographs on Selected Medicinal Plants, vol. 1. Geneva: World Health Organization, 1999.